An encroachment permit is necessary when anyone (including utility companies, residents and contractors) works in the city right-of-way, city-owned land, and/or within a city easement. 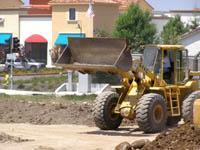 The City of Rocklin grants permission to applicants to transport overweight or oversized equipment, with restricted limits, on the streets within the city limits of Rocklin. The Rocklin Municipal Code (Chapter 12.24) regulates the closing of any street within the City of Rocklin for the purpose of holding a celebration such as a block party.